Los Angeles, California – Diamond Multimedia, the leading manufacturer of Graphics Cards, USB Video Technology and award-winning best seller of popular Multimedia products, introduced today the next generation Universal Docking Station using Display Link DL-6950 chipset. 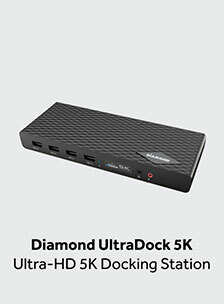 The Diamond Ultra Dock DS6950 is a 5K USB Docking Station capable of supporting dual 4K 60Hz Ultra HD displays over a single USB connection to any laptop. Compatible with Both Type-C, Type-A and Thunderbolt 3 Laptops /Desktop PC’s. Using one single USB connection from the Diamond DS6950 Ultra Docking Station to your laptop, you can easily connect your PC to one 5K (5120 x 2880) 60Hz UHD display (DisplayPort Only) or two 4K (4096 x 2160) 60Hz UHD displays. The Diamond Ultra Dock DS6950 provides six additional USB 3.0 ports, Fast Gigabyte Ethernet Port, separate Mic input and Audio output. With a single USB cable, this powerful docking station lets you connect two 4K2K ultra-HD 60Hz monitors or a 5K monitor using dual DP ports to your computer, giving you maximum flexibility at maximum resolutions. With its Front-loading feature, the Diamond Ultra-Dock 5K- DS6950 gives you 15 ports for all the connectivity you need. The built-in USB ports connect projectors, webcams, headphones, printers and other USB devices. The Front-Loading side access features 4 USB 3.0 ports, an easy access audio port, and a Mic-In port. 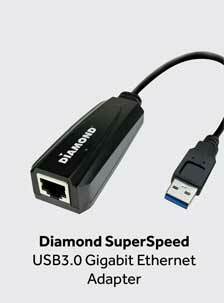 The Diamond DS6950 offers unbeatable universal connectivity. The back side features a Gigabit Ethernet port, two 4K HDMI ports, two 4K Display Ports which can be combined to connect a 5K monitor, two more USB 3.0 ports, and a USB-C port. The USB-C PORT can be connected to a USB Type-C computer and is backward compatible with USB Type-A. Compatible cables are included. The Diamond Ultra-Dock 5K is fully certified by DisplayLink. Plug and Display. 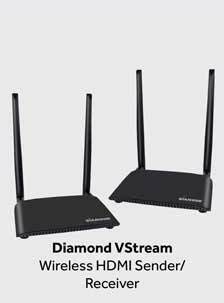 The Diamond DS6950 offers the best visual networking technology for any device and virtually any operating system, with universal connectivity including USB Type –C. Easily stay organized and connected by taking your Laptop or Tablet from your home to the office. Expand workstations and enhance productivity. Enjoy your work with an incredible 14.7 million pixels. 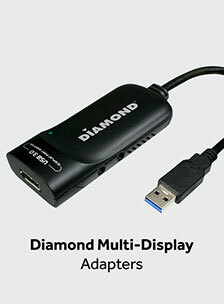 The Diamond DS6950 is available at the Diamond Multimedia Online Store. The device retails at $199.99. The Diamond DS6950 comes with a one-year limited warranty, a Diamond guarantee of quality manufacturing and US-based customer support system. Diamond products are available to the public throughout North America and Europe through retailers, resellers and systems integrators as well as top technology product distributors. Diamond products stand for performance, quality, and value.